When your spend data is visible, it’s easier to find answers. An AMI-Partners study of financial decision-makers at small and midsize businesses (SMBs) makes a strong case for automating expense, travel, and invoicing. SMBs across industry sectors report significant average annual savings and benefits. In the ever-evolving business landscape, managing company spend has become progressively more challenging for financial decision makers. Increasing mobile workforces, and an expanding number of vendors and invoices mean more transactions to track and manage. Automating expense, travel and invoicing is a sure way to gain a precise picture of how money is flowing through an organization. Firms of all sizes, geographies, and industries have found that automation is a simple and effective method for improving efficiencies, reducing operating expenditures, and boosting employee satisfaction. 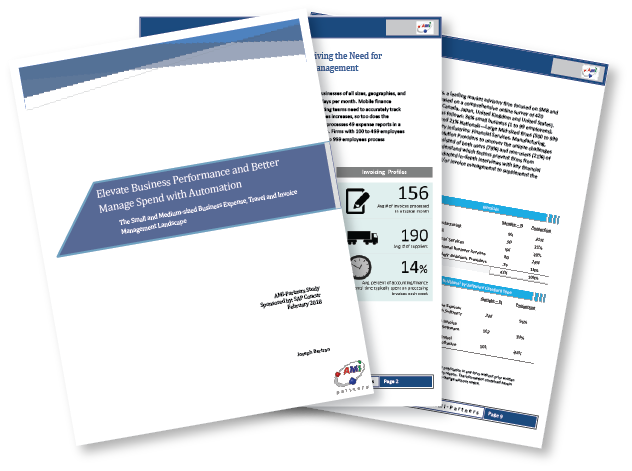 Download the report today to learn more about the benefits of automated solutions.